Pittsburgh Underground: Artsy Fartsy: Art All Night 2014 THIS WEEKEND!!! Artsy Fartsy: Art All Night 2014 THIS WEEKEND!!! The 17th installment of Art All Night will be held beginning 4 p.m. Saturday, April 26, 2014, to 2 p.m. Sunday, April 27, 2014. Art All Night is an annual non- juried, uncensored 24-hour art show in the Lawrenceville neighborhood of Pittsburgh. Art All Night admission and artist participation is free and open to the public. Art All Night merchandise is available for purchase and a live art auction features the collaborative work of on-site artists. All the proceeds from the evening directly support Art All Night. The 17th annual Art All Night will feature original artwork, activities for children and adults, an art auction and live entertainment. Throughout the night, guests can participate in collaborative art activities, including chalk art, group improv sessions, and memory drawing. On-site artists will collaborate to create a work of art, and the live art auction gives guests a chance to bid on the pieces created during the 24-hour period. Children's activities will be held from 4 to 8 p.m. Saturday, April 26, and again 10 a.m. to 2 p.m. Sunday, April 27. The children's area will be adjacent to a youth-friendly section of art; the rest of the show is uncensored. Children and families will have the chance to build their own cardboard city, weave using recycled materials, and create silkscreen prints, among other fun activities. Art All Night is a community event that gives everyone an opportunity to exhibit art. Artists are encouraged to participate by submitting one work to the show, regardless of age or skill level. All mediums are accepted and participation is always free. Registration will be available online in early April at artallnight.org. To participate in the show, artists must drop off their work between 10 a.m. to 2 p.m Saturday, April 26, at Willow Street Development, 40th and Willow Street in Lawrenceville. All artwork must arrive ready to hang or otherwise be displayed. Artists submitting work will need to show a photo ID during both registration and pickup; art pickup is 2:30 to 5:30 p.m. Sunday, April 27. Donations can also be made to the event in all forms from local businesses and friends of Art All Night. All donors will be listed on the acknowledgement board during the event. Art All Night is an event organized and staffed entirely by a dedicated team of volunteers. Volunteer shifts are available throughout the 24 hour period and volunteers can assist with various tasks during the event. Visit artallnight.org to learn more about volunteering and donation opportunities. Connect with the Art All Night team via social media. 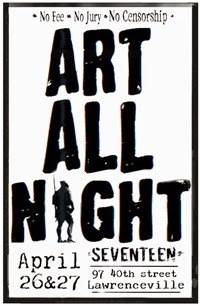 Join the event on the Official Art All Night Facebook Page and follow @ArtAllNight on Twitter for event updates, behind-the- scenes pictures and more. Find inspiration, photos and other information for this year’s Art All Night: Lawrenceville by searching the hashtag #AAN17. Use #ImAnArtAllNighter to be a part of the conversation with the Art All Night volunteer team and other Art All Night participants.